^ a b c d e f g h i The Oxford companion to wine. Robinson, Jancis. (3rd ed ed.). Oxford: Oxford University Press. (2006). ISBN 0198609906. OCLC 70699042. https://www.worldcat.org/oclc/70699042. ^ a b c d e f g h i j k l m n o p q r s t u v w x y z aa ab ac ad ae af ag Oz., Clarke, (2001). Oz Clarke's encyclopedia of grapes. Rand, Margaret. (1st U.S. ed ed.). New York: Harcourt. ISBN 0151007144. OCLC 48239622. https://www.worldcat.org/oclc/48239622. ^ Wines and spirits : understanding style and quality. Wine and Spirit Education Trust (Great Britain) (2nd rev. ed ed.). London: Wine & Spirit Education Trust. (2012). ISBN 9781905819157. OCLC 889899456. https://www.worldcat.org/oclc/889899456. ^ a b c d e f g h i j k l m Evan., Goldstein, (2006). Perfect pairings : a master sommelier's practical advice for partnering wine with food. Goldstein, Joyce Esersky., Pool, Joyce Oudkerk.. Berkeley: University of California Press. ISBN 9780520243774. OCLC 61478729. https://www.worldcat.org/oclc/61478729. ^ Alley, L (September 30, 2007). “New French Wine Grape Arrives in US Market”. The Wine Spectator: p. 17. ^ Jancis., Robinson, (2012). Wine grapes : a complete guide to 1,368 vine varieties, including their origins and flavours. Harding, Julia., Vouillamoz, Jose.. London: Allen Lane. ISBN 9781846144462. OCLC 795857065. https://www.worldcat.org/oclc/795857065. ^ Walker, A. R.; Lee, E.; Robinson, S. P. (2006). 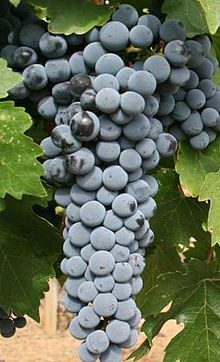 “wo new grape cultivars, bud sports of Cabernet Sauvignon bearing pale-coloured berries, are the result of deletion of two regulatory genes of the berry color locus”. Plant Mol Biol 62 (4–5): 623–635. ^ 1951-, Stevenson, Tom, (2005). The Sotheby's wine encyclopedia. Stevenson, Tom, 1951-, Sotheby's (Firm) (4th ed., fully updated ed.). London: DK. ISBN 0756613248. OCLC 63178380. https://www.worldcat.org/oclc/63178380. ^ Mary., Ewing-Mulligan, (2001). Italian wine for dummies. McCarthy, Ed.. New York: Hungry Minds. ISBN 0764553550. OCLC 48026599. https://www.worldcat.org/oclc/48026599. ^ J. Gaffney (December 31, 2006). “Drinking Cabernet May Cut Risk of Alzheimer's, Study Finds”. Wine Spectator Magazine: 17. ^ Marambaud P, Zhao H, Davies P (2005). “esveratrol promotes clearance of Alzheimer's disease amyloid-beta peptides”. J. Biol. Chem 280 (45): 37377–82. ^ Fantinelli, J. C.; Mosca, S. M (2007). “Cardioprotective effects of a non-alcoholic extract of red wine during ischaemia and reperfusion in spontaneously hypertensive rats”. Clin Exp. Pharmacol. Physiol 34 (3): 166–169.